Signs and augurs – For the fainthearted . . . Through the grey cloud canopy, there was faint sunshine. A halo surrounded the white light, to be more precise, a 22 degree halo. Full scientific explanations of the common phenomenon are readily available. The light is refracted by ice crystals in the clouds, the hexagonal shape of the crystals causing it to refract by 22 degrees or more. 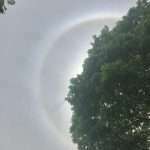 Despite its commonplace nature, (such halos are said to occur on one hundred or more days each year), with filtering provided by a nearby tree, assisted by an adjustment of the iPhone light balance, an interesting picture was formed. 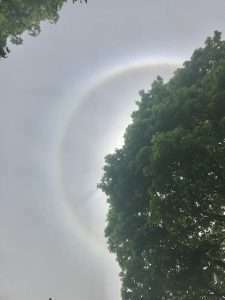 22 degree halos have been said to augur the arrival of stormy weather fronts, but they also occur at times of settled weather, suggesting they are not a reliable augur of anything. A reliable sign or not, the posting of the image on Instagram brought a comment from a Leinster supporter in Bilbao that he hoped the halo was a sign of good things to come in the European Rugby Champions Cup Final. (A faint ray of sunshine might have seemed preferable to the pouring rain in the Basque Country). Since early times, signs in the sky have been believed to augur events at a more terrestrial level. Alignments in the night sky were studied with keenness as possible indicators of how the future would unfold. Comets were often seen as bringers of misfortune and disaster. Eclipses were invariably forebears of dark events. The moon appearing in an unusual way was something feared. Signs in the sky might be portents of anything from a personal loss to a national disaster. It is hard to imagine the fear felt by those who believed in a geocentric universe, those who believed the entire cosmos was centred upon the small planet upon which they lived and that their lives were lived under the eye of malignant powers. To live under such a threat meant every possible indication from the gods must be precisely discerned for fear that ignoring it or mistaking it might bring disfavour and disaster upon one’s head. Even the word “augur” came from the name of the person in Roman times who was charged with divining the future. It is a delight to live in times when the appearance of a halo in the sky means no more than taking a photograph before going to Google for a scientific description, when “signs” have lost their power to frighten, when their appearance is followed by no more than their disappearance. (Of course, the halo did augur well for Leinster, who became European champions for the fourth time after Racing 92 missed a drop goal with the final kick of the match).